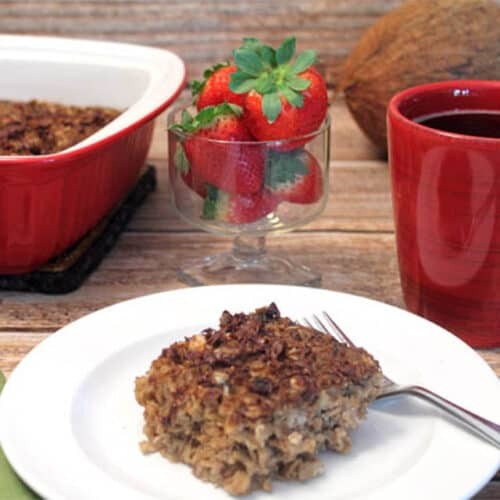 OMG is this Tiramisu Oatmeal Bake ever yummy! It tastes like you are having dessert for breakfast & who wouldn't like that? Its healthy, quick & easy too! Preheat oven to 375 degrees. Spray an 8-inch square baking dish with non-stick spray. In a large bowl, combine oats, baking powder, salt & cocoa powder. In a medium bowl, whisk together the strong coffee and cream cheese. You may have to use a fork to mash the cream cheese a little and help it blend well. Continue to whisk in egg, butter, milk, maple syrup and extracts until well combined. Mix the liquids into the dry and stir well. Pour into the prepared baking dish. Bake 35 minutes. Remove and let cool at least 10 minutes before cutting and serving. I like to put a few dark chocolate chips on top as it is cooling then spread to smooth. You could also drizzle a little chocolate over the top or leave off all together. For on-the-go meal, place in refrigerator until chilled, remove and slice into squares. Wrap squares in plastic wrap and freeze. To reheat, unwrap and place in microwave for 1-1/2 to 2 minutes or until warmed.